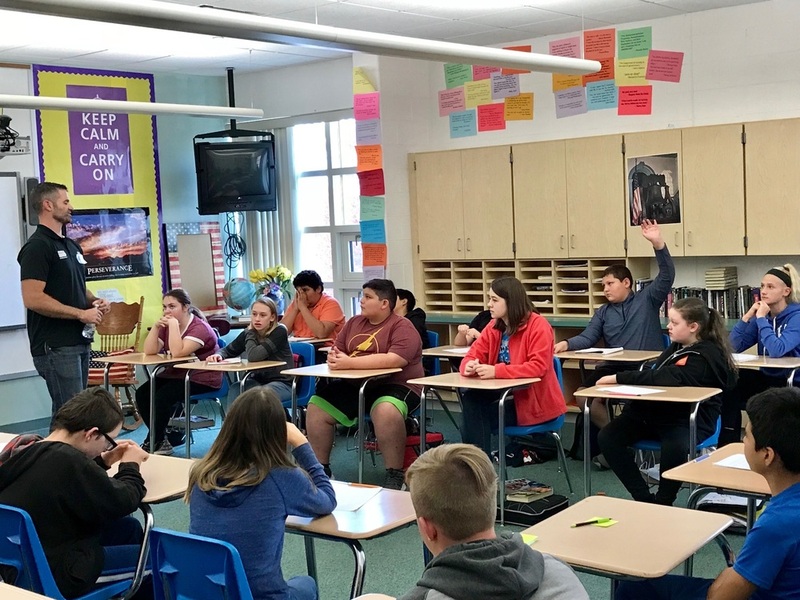 Mrs. Phillis's 7th grade classes were honored to have two guest speakers visit their classroom Friday and talk about their experiences with the U.S. Military. The students are participating in the VFW Essay Competition, “Why I Honor the American Flag.” The speakers hoped to inspire the students in their writing. Mr. Andrew Stoltz, of the Illinois National Guard, spoke of his family history in the military, his experiences in basic training, as well as the sacrifices that he and every other serviceman has made for our country. His wife, Jaclyn, spoke of the many sacrifices that the families also make. Heather Bankowski spoke of her sons recent enlisting with the U.S. Air Force. Zach Bankowski recently completed basic training and will soon be training to be a loadmaster. She talked about his lifelong dream to serve, and of the sacrifices made by all military families. Students were both intrigued and inspired, while their many questions were answered by the speakers. Thank you for your service!